These babies have been well-bred, well-fed, well-socialized, and raised under foot with 100% organic pure love. Kittens have all been given a clean bill of health by our veterinarian, and received all of the contracted early veterinary care. 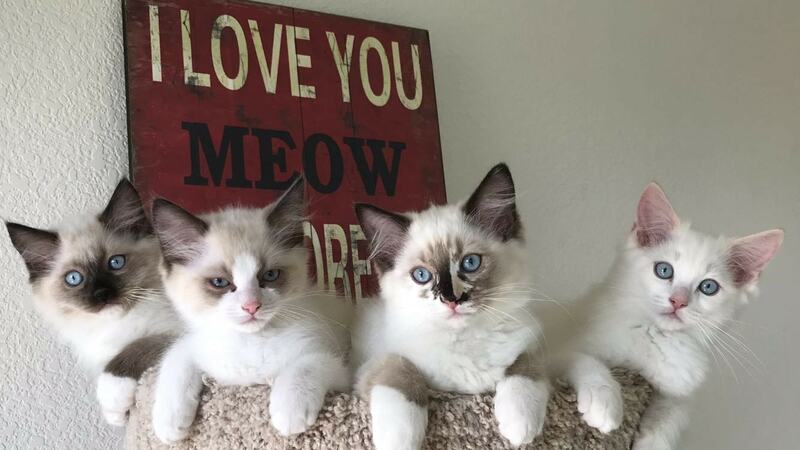 These bubs are ready for adoption, and are seeking their furever families. Please review our "adoption fees" page, for detailed fee information. If you would like to inquire about adoption, please send an email to TempleDolls@yahoo.com. You may also send us a message us on the facebook page. Please do not make a non-refundable deposit on a kitten if you have not read this website, in its entirety. Impulse decisions are not recommended. Click here to place a deposit on a kitten. Please view our current kitten calendar on the nursery page. We are currently accepting waitlist deposits for our 2019 babies. Available kittens are updated to this page AFTER they are made available for adoption by families on our waitlist on our scheduled, in-person, adoption days. The Kindred/Poe Spring 2018 bubs. All adopted and happy in their furever homes.